Technical Math For Dummies is your one-stop, hands-on guide to acing the math courses you’ll encounter as you work toward getting your degree, certification, or license in the skilled trades. You’ll get easy-to-follow, plain-English guidance on mathematical formulas and methods that professionals use every day in the automotive, health, construction, licensed trades, maintenance, and other trades. You’ll learn how to apply concepts of algebra, geometry, and trigonometry and their formulas related to occupational areas of study. Plus, you’ll find out how to perform basic arithmetic operations and solve word problems as they’re applied to specific trades. Whether you’re a student currently enrolled in a program or a professional who is already in the work force, Technical Math For Dummies gives you everything you need to improve your math skills and get ahead of the pack. 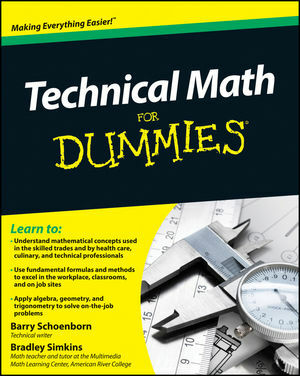 Barry Schoenborn is a technical writer who has worked in many of the trades described in the book. Bradley Simkins has taught numerous classes and tutored at the Multimedia Math Learning Center at American River College in Sacramento. Part I: Basic Math, Basic Tools. Chapter 1: Math that Works as Hard as You Do. Chapter 2: Discovering Technical Math and the Tools of the Trades. Chapter 3: Zero to One and Beyond. Chapter 4: Easy Come, Easy Go: Addition and Subtraction. Chapter 5: Multiplication and Division: Everybody Needs Them. Chapter 6: Measurement and Conversion. Chapter 7: Slaying the Story Problem Dragon. Part II: Making Non-Basic Math Simple and Easy. Chapter 8: Fun with Fractions. Chapter 9: Decimals: They Have Their Place. Chapter 10: Playing with Percentages. Chapter 11: Tackling Exponents and Square Roots. Part III: Basic Algebra, Geometry, and Trigonometry. Chapter 12: Algebra and the Mystery of X. Chapter 13: Formulas (Secret and Otherwise). Chapter 14: Quick-and-Easy Geometry: The Compressed Version. Chapter 15: Calculating Areas, Perimeters, and Volumes. Chapter 16: Trigonometry, the "Mystery Math". Part IV: Math for the Business of Your Work. Chapter 17: Graphs are Novel and Charts Are Off the Chart. Chapter 18: Hold on a Second: Time Math. Chapter 19: Math for Computer Techs and Users. Chapter 20: Ten Tips for Solving Any Math Problem. Chapter 21: Ten Formulas You’ll Use Most Often. Chapter 22: Ten Ways to Avoid Everyday Math Stress.